Surprising new data and ice-sheet modeling suggest that between roughly 14,500 and 9,000 years ago, the ice sheet below sea level partially melted and shrunk to a size even smaller than today–but it did not collapse. Over the subsequent millennia, the loss of the massive amount of ice that was previously weighing down the seabed spurred uplift in the sea floor–a process known as isostatic rebound. Then the ice sheet began to regrow toward today's configuration. "The WAIS today is again retreating, but there was a time since the last Ice Age when the ice sheet was even smaller than it is now, yet it didn't collapse," said Northern Illinois University geology professor Reed Scherer, a lead author on the study. "That's important information to have as we try to figure out how the ice sheet will behave in the future." Don't count on isostatic rebound, however, to be a panacea for modern-day rising sea level, he added. "What happened roughly 10,000 years ago might not dictate where we're going in our carbon dioxide-enhanced world, where the oceans are rapidly warming in the polar regions. If the ice sheet were to dramatically retreat now, triggered by anthropogenic warming, the uplift process won't help regrow the ice sheet until long after coastal cities have felt the effects of the sea level rise." Scherer is one of three lead authors on the study, along with Jonathan Kingslake of Columbia University's Lamont-Doherty Earth Observatory and Torsten Albrecht of the Potsdam Institute for Climate Impact Research in Potsdam, Germany. The scientists were carrying out independent investigations that took different routes to the same conclusion of past grounding-line retreat and advance. "We were all working in parallel, saw each other's results at conferences and decided to combine our efforts," Scherer said. 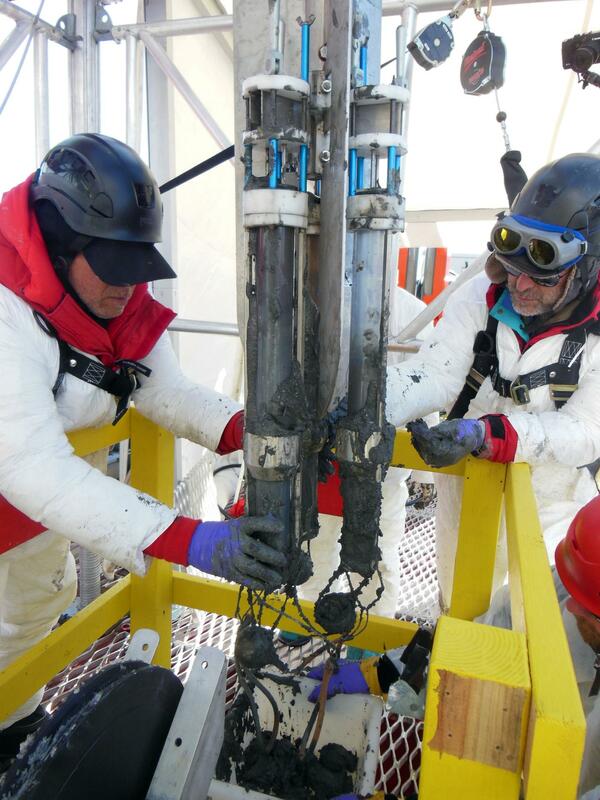 Scherer's team analyzed sediments recovered from beneath a grounded area of the WAIS in the Ross Sea region. The area was thought to be covered by grounded ice since the last Ice Age, 20,000 years ago. But the scientists were surprised to find marine organic material containing radioactive Carbon-14 in the sub-ice sediments, indicating that it was connected to the ocean much more recently than anybody thought. The WAIS, they concluded, had retreated more rapidly and much more extensively than had been previously documented, with the grounding line (where ice, sea and the sea floor meet) pulling back more than 200 kilometers beyond the current position, before re-advancing toward its present position about 1,000 years later. "When we drilled through a half mile of ice at today's grounding line, where a thin sliver of ocean beneath floating ice is opening as the ice retreats now, we were surprised by an active community of marine organisms, including fish, living right up against the ice," Scherer said. "There are no fish where the ice is grounded on the sea floor, but radiocarbon in sediments 200 kilometers upstream tells us that the sea had been much farther back before. Ocean creatures left behind a radiocarbon clock." Meanwhile, Kingslake and a colleague conducted ice-penetrating radar observations of grounded ice on the other side of the WAIS, in the Weddell Sea region. They discovered many buried features within the ice sheet, interpreted as relic crevasses that had later filled with marine ice. These and other ice features were consistent with past ocean melting and floating ice–as well as a grounding line that had receded since the last Ice Age well inland of today's margin. "It was just bizarre," Kingslake said. "We hadn't seen these kinds of structures near the base of an ice sheet before, and the best explanation is that they formed as this portion of the ice sheet re-grounded." "The warming after the last Ice Age made the ice masses of West Antarctica dwindle rather rapidly," Albrecht said. "It retreated inland by more than 1,000 kilometers in a period of 1,000 years in this region – on geological time-scales, this is really high-speed. But now we detected that this process at some point got partially reversed. Instead of total collapse, the ice-sheet grew again by up to 400 kilometers. This is an amazing self-induced stabilization. However, it took a whopping 10,000 years, up until now. Given the speed of current climate-change from burning fossil fuels, the mechanism we detected unfortunately does not work fast enough to save today's ice sheets from melting and causing seas to rise." "The model of the past doesn't show retreat of Amundsen Sea glaciers much beyond the present-day grounding line," Scherer said. "So what's happening today in that sector is troublesome and could be a wildcard in all this."